You might think everyone is excited about the upcoming college football season. But you’d be wrong. For nerds of the Big Ten Network , the end of summer is also the end of Big Ten Network summer programming. This means no more countless replays of Vaughn Dunbar’s 39-carry, 147-yard performance over Kentucky in 1991, no more shows about the 10 best left-handed basketball duos from 1974-1977, no more profiles on Purdue alum Orville Redenbacher. But come on, you say. Nobody watches this stuff, right? Once again, you’d be wrong. Between the months of May and August, Nielsen data shows the Big Ten Network attracts an average daily household rating of somewhere between zero and greater than zero. This means someone out there is watching this stuff. Face-painting is a given. 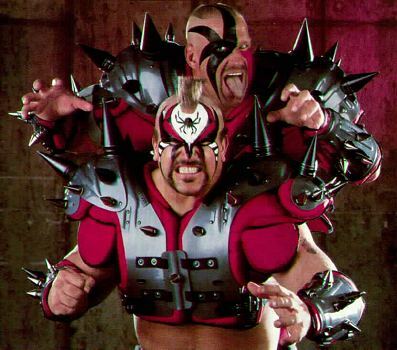 The spiked shoulder pads – an obvious homage to the famed wrestling tag team known as the “Road Warriors” – are a nice touch. The monkey-shaped logo on the shoulder pads, I have no idea. I do know that to this person, the idea of waiting until next May to watch the same profile on Red Grange causes severe stress and anxiety. In fact, as we draw closer to the season, the Big Ten Network’s programming changes are already underway. Football team preview shows have already begun to replace things like marching band auditions. Want to know what the Ohio State Buckeyes chances are this year? Better not blink, it’s only airing 17 times this weekend. Soon, a few actual live football games will be televised. This will replace things like replays of spring scrimmages. Yes, I said scrimmages, which are essentially practice. Yes, Allen Iverson, we are talking about practice. You must understand though, to a Big Ten Network nerd, practice counts as real programming, and you better believe scores of nerds are tuning in to watch college-aged men stand around in tight pants and take scheduled water breaks. But soon, for nerds everywhere, it will all come to an end, and once again Iowa quarterback Chuck Hartlieb’s school-record 558-yard passing performance against Indiana in 1988 will be a thing of the past. At least until next May. This entry was posted on Friday, August 19th, 2011 at 12:12 pm and is filed under College Sports, Joe Sports Fan. You can follow any responses to this entry through the RSS 2.0 feed. You can leave a response, or trackback from your own site.